We turned up in a positive frame of mind after the goalless draw seven days before. There had been enough to indicate that Mauricio Pellegrino was at least beginning to get to grips with formations and how to utilise the players. As we arrived in our seats, the conversations of those already there was of an apparent serious injury that had been suffered by West Ham's Kiwi International, Winston Reid while warming up. Nobody seemed to know exactly what the problem was, but it was serious enough for him to have been carried off on a stretcher. Obviously as a recognised starter there would have to be some unwanted reorganisation of their team. When the stadium announcer went through their team it was clear that Ogbonna had taken Reid's place alongside Fonte. Ironically Reid had only signed a new six year contract the day before. 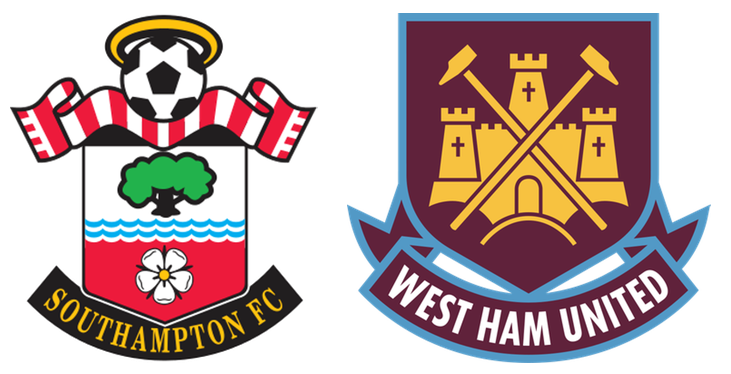 Anyway, enough of them, initially Saints seemed to make a quiet start, but West Ham were giving them more space at the back than Swansea the week before. It didn't take long for Gabbiadini to pick the ball up and run straight at the defenders, passing it to Redmond out on the left wing, while gesturing exactly where he wanted the ball back. Redmond did as asked and slipped a wonderful pass to the Italian, who shot across the goal, finding the far corner of the net, beyond Hart. Cue wild rejoicing at the first goal seen in the Premier League at St.Mary's for more than 550 minutes of play. 1-0. I was surprised that West Ham were getting away with so much sly shirt pulling and shoving. Then the vile Arnautović blatantly elbowed Jack Stephens in the neck with considerable force, but right in front of referee Lee Mason, who had no hesitation in showing a red card. The player did not take this well and argued endlessly, taking an age to leave the field. As he went to walk down the tunnel he kicked a bag of kit with considerable force. Not a particularly clever thing to do, as he could have no real complaints at his dismissal. The replays on MOTD that evening made it look even worse than it did at the time. Saints then huffed and puffed for a while, without making too much headway. Thankfully José Fonte very kindly put an arm around Steven Davis' neck in the penalty area, when he didn't really need to, Davis having already lost the ball, enabling Mr Mason to award a penalty, which Tadić converted, just. He shot straight down the centre, as Hart dived to the right. The ball hit the keepers feet, but had enough weight on it to go in. 2-0. That was as good as it got, almost until the end of the match, as we looked very pedestrian against 10 men. West Ham stretched us all over the place and it was no real surprise when the arch-poacher, Hernandez tapped the ball home after Forster pushed the ball straight to him after parrying Antonio's shot. Incidentally, isn't Antonio a huge, but skilful unit? A bit different from the young player on Saints books all those seasons ago. The goal was almost exactly on half-time and was a psychological lift for the Londoners that they hardly deserved. 2-1. In the second half it was more of the same, we looked clueless as to how to get through the massed ranks of the West Ham defence and the more the game went on, the worse we looked. It was about this time that someone said that the debutant, Mario Lemina looked like another Wanyama, powerful and good in the tackle, but unable to pass more than 5 yards. Although I didn't agree, I knew what he meant, but I think it was more a case of the new boy expecting his team mates to show a bit more anticipation. I suppose that comes with playing with Juventus. Incidentally, Lamina posted on social media a picture of a gash on his leg, resulting from a dreadful tackle from Noble, that didn't even merit a talking-to from Mr. Mason. Ward-Prowse replaced Lamina with about half an hour to go. Then that stroppy little poacher Hernandez did it again. A header came back off the crossbar and there he was to tap it in. The Wet Spam fans were loving it and chanting "You f*cked it up 2-0" and I must say, at that point, I agreed with them. 2-2. This was Saints worst passage of play, when they seemed to have lost their way. On 80 minutes Mauricio Pellegrino went for it, hauling off Davis and Gabbiadini, replacing them with Long and Austin. He changed the formation as well and it worked immediately. Suddenly we had them back-pedalling. The ball was going to go in the net. Eventually. You just had that feeling. The thing I loved was in the post match interviews Charlie Austin credited Noble with changing his mind which way to take the penalty. Last laugh and all that. Lots of things wrong from Saints point of view, but I like Mauricio Pellegrino. With every match I become convinced that we have someone that knows exactly what he is doing. Some commentators went for Tadić, but to me he was just the normal Dušan, some things good, some things bad. No, my MOTM is Maya Yoshida, who had a tremendous game, with some crucial interceptions and he won us the penalty from which the winning goal was scored. That had to be one of the very best games that I have seen Maya play.